Strollers/Prams have now become the core need for parents as its used from 0-4 years. Safety, Design, comfort and foldable mechanism have become main points while selecting the right stroller for your baby. We understand the need of parents for folding mechanism very well. Therefore R for Rabbit brings you most compact folding stroller called Twinkle Twinkle. Twinkle Twinkle becomes the ideal choice of parents who wants all features of big stroller and have the most compact folding mechanism for their travel needs. Twinkle Twinkle Stroller is your Travel Companion. Safety 1st - Twinkle Twinkle is EN 1888 Certified which is most stringent certification defined by European standards for strollers for Safety of Babies and Toddler. Every minor point is considered to give safest product to your Baby. 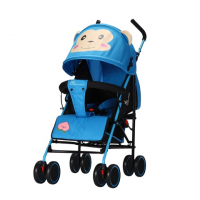 Front Wheels and Suspension - The Best suspension designed to give smoothest ride to you Baby while strolling. Best suspension especially designed for tough roads of India. 6 inch front wheels to swivel or to lock for long strolling. Welcome to the Fold - Just pull your foot up and then unlock the hand lock and strollers folds down in snap. Its so portable that you can carry on your shoulder or carry with just one hand. To Recieve updates and possible rewards for R for Rabbit Twinkle Twinkle- Compact Folding Baby Stroller Green please sign in. To Recieve updates and possible rewards for Strollers & Prams please sign in.